At a meeting with Pinkerton Landcare and Environment Group (PLEG), Regional Rail Revival, Melbourne Metro Rail Authority and LendLease concerning removal of native grassland vegetation from the rail corridor between Deer Park and Melton, PLEG were informed that a stand of Drooping Sheoke trees, a few hundred metres east of Ferris Road was to be removed to make way for railway duplication works. Also to be removed is virtually all the native vegetation within the rail corridor. 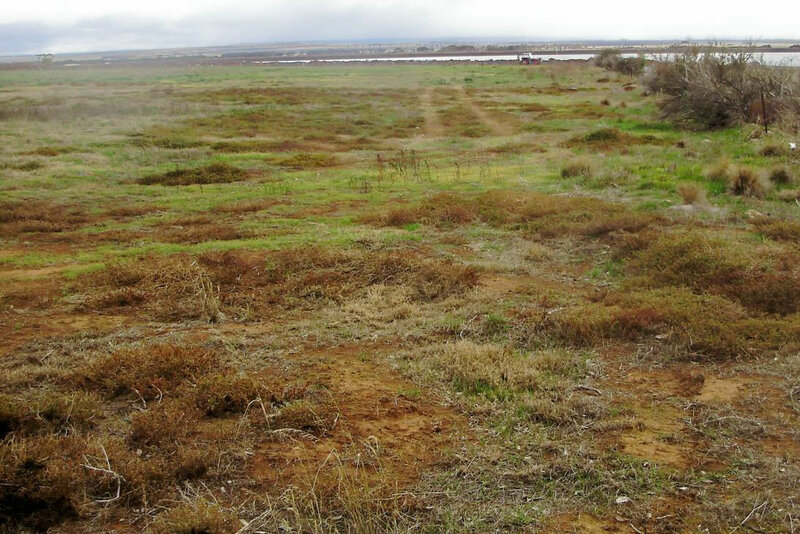 This has been a last refuge of native grassland vegetation in the western region. 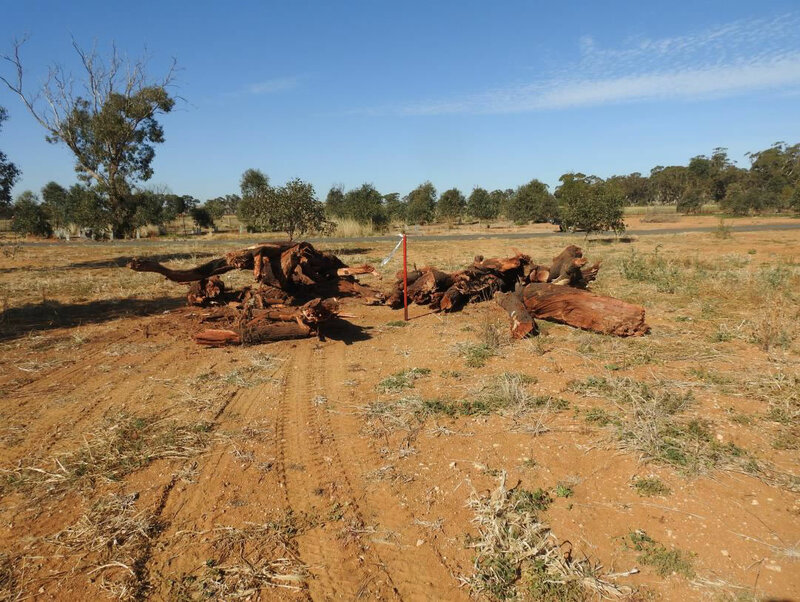 Pinkerton Landcare and Environment Group requested that the Drooping Sheokes destined to be removed from the railway corridor be recycled for environmental purposes and placed in a local woodland, rather than being merely mulched, burnt or otherwise disposed of. The biodiversity value of the Grey Box Woodland under creation in Pinkerton Link would be greatly improved by the addition of these tree trunks and logs. The process of creating a forest here would be greatly enhanced as it will provide a ready-made wildlife habitat of woody debris, as the Grey Box trees we already have planted grow around them. Naturally grown woody debris of this kind would otherwise take centuries to develop! A precedent for a project involving relocation of felled tree trunks already exists. In August of 2007 Western Water consulted with local environmental groups (as well as the local community in general) about the upcoming Melton Sewerage Upgrade. This would involve a new sewer main to service the growth corridor of Melton and Melton South. The pumping station at Blamey Drive would be replaced with a gravity fed pipeline, reducing the use of electric and diesel pumps and cutting greenhouse gas emissions, while catering for population increase. It was announced that a new sewer pipe would go south along Ferris Road. During the course of this consultation it was stated that a number of mature trees would need to be removed from Ferris Road to accommodate this new pipeline. When it became certain that it was unavoidable that these trees would be removed PLEG enquired as to what would be the fate of these felled trees, and if they could be reused as wildlife habitat. In 2006 a Flora and Fauna Report was conducted at Pinkerton Forest and Bush’s Paddock by Ecology Australia. Western Water offered the trees to PLEG, for placement into Upper Pinkerton, the newest acquisition for Pinkerton Forest (added to the reserve in 2005). This area of former farmland, owned by Western Water, consisted of 12 hectares of heavily grazed old growth Grey Box trees, with mainly pasture grasses, weeds and virtually no natural understory. There were almost no fallen trees or branches as these had been removed for firewood over the past 150 years of grazing and farming. By following the recommendation of the Flora and Fauna report the biodiversity value of the newly acquired woodland was greatly enhanced by the addition of these large tree trunks and logs. On Saturday 20th September 2008 the logs were placed among the trees, to simulate fallen trees and branches. The bare areas between the old trees quickly took on an appearance of more natural looking woodland as the large logs were placed on the ground. Many of these logs had natural hollows, increasing their value as wildlife habitat. The woody debris in the woodland will be incrementally added to over time as large branches fall from the old growth trees, and old trees themselves fall. This project should be an interesting and useful experiment in biodiversity enhancement. Woodland dependent birds such as Brown Treecreepers soon moved into the woodland. Although it would have been preferable if these old trees could have remained standing, it was decided that if it were unavoidable that they were to be felled, then they ought to be put to practical environmental use. Rather than see them converted to woodchips, or used as firewood (thus contributing to carbon emission into the atmosphere) it would be better to see them continue to fulfill their function as wildlife habitat. This is a good example of PLEG and Western Water working in partnership (with informed guidance from Ecology Australia) to achieve environmental restoration. An unfortunate instance of environmental loss and habitat destruction was recognized as an opportunity to be seized and turned into a biodiversity win. 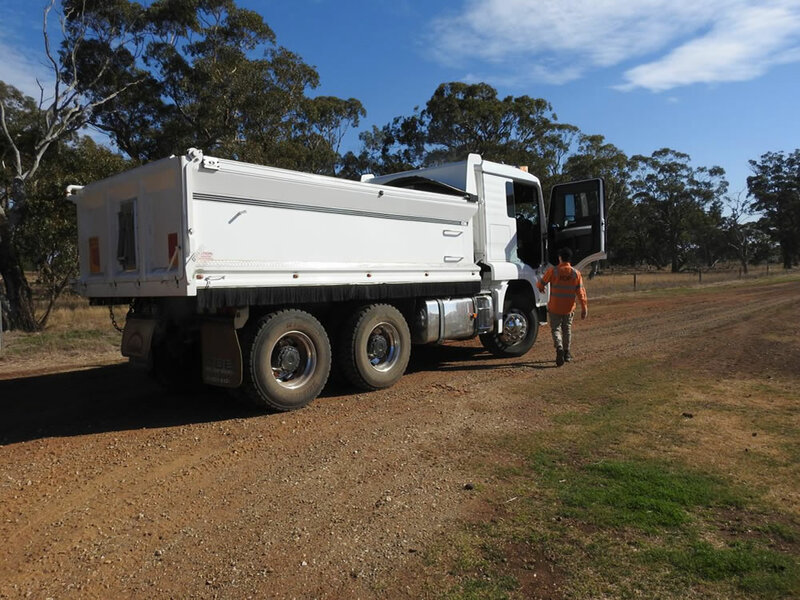 Similarly, this was seen as an exercise whereby Lendlease, Western Water and Pinkerton Landcare and Environment Group could be seen to be working in concert to achieve an environmentally good result. The regrettable but unavoidable loss of these ancient trees could be seen as turning an environmental loss into an environmental gain! Although it would have been preferable if these trees could have remained standing, it was decided that if it were unavoidable that they were to be felled, then they ought to be put to practical environmental use. Rather than see them converted to woodchips, or used as firewood (thus contributing to carbon emission into the atmosphere) it would be better to see them continue to fulfill their function as wildlife habitat. 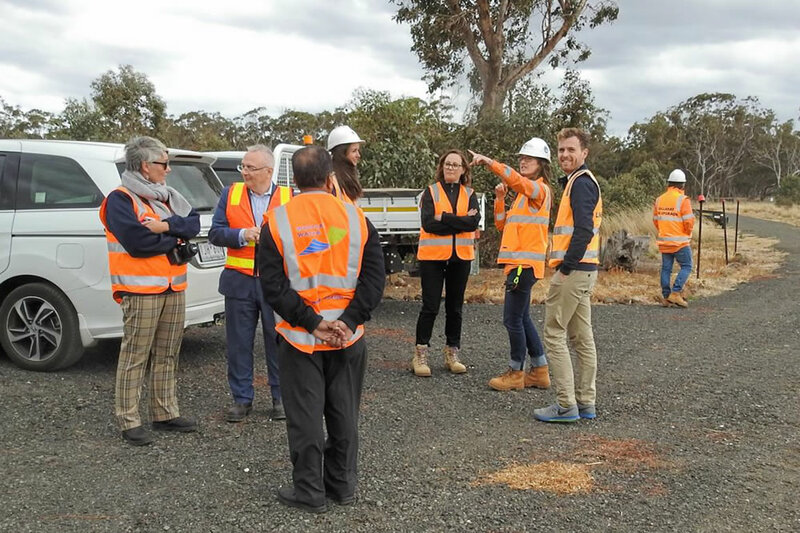 This could be seen as an exercise whereby Lendlease, Western Water and Pinkerton Landcare and Environment Group could be seen to be working in concert to achieve an environmentally good result. The regrettable but unavoidable loss of these ancient trees could be seen as turning an environmental loss into an environmental gain! “while the trees have been removed from the rail corridor, part of the area where the sheoaks were removed from will become the new Toolern Station. 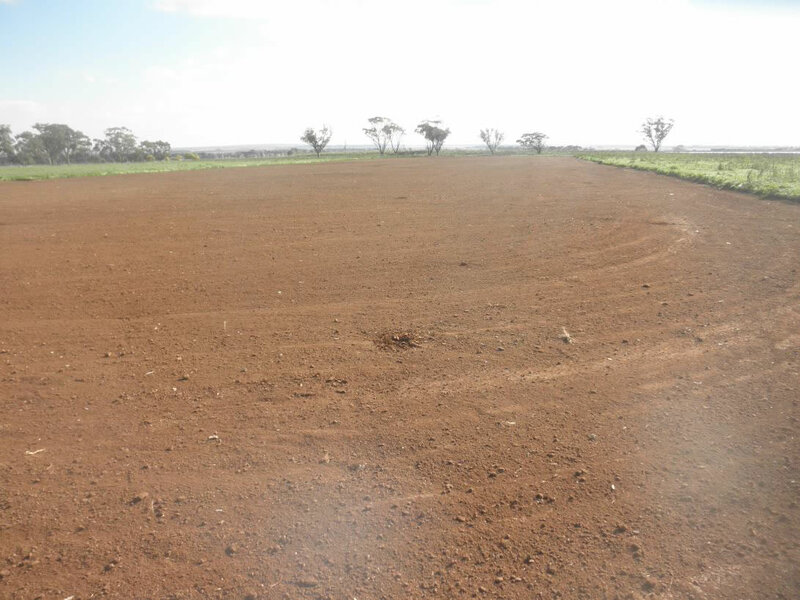 We hope to incorporate indigenous sheoak seedlings into the landscaping there, as part of the ecological and historical link that you’ve referred to. The next activity at Pinkerton Link will be to place the logs in their final resting spots, and I’ll contact you soon regarding that. Thanks for working with us on this project to date. 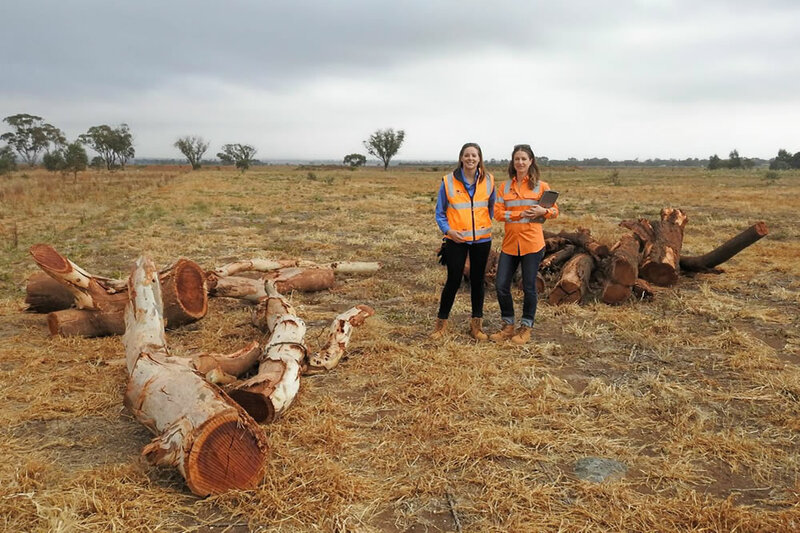 On Monday 23rd April Western Water, Western Land Services (Environmental Contractors) & PLEG held a meeting on site to determine where the logs were to be ultimately deposited. 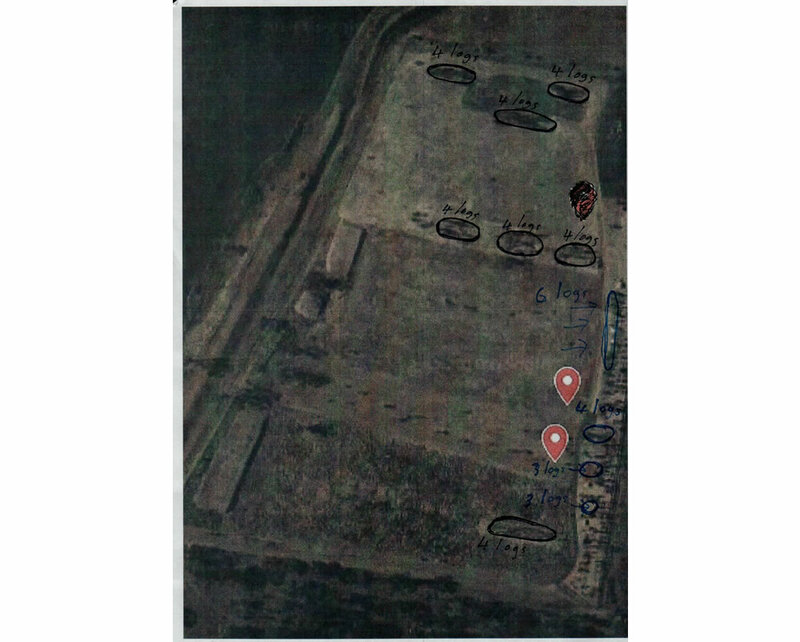 A map was handed to Western Land Services (WLS) detailing there the logs were to placed. WLS decided that they should be able to provide a front end loader for the day in a couple of weeks’ time. On Wednesday Steve of Western Land Services arrived with a front-end loader to relocate the logs to their final resting places. The task was a demanding one as we had asked him to place the logs among the trees already planted, without damaging any of these! This involved manoeuvring the loader, with the logs in its mechanical maws in and around young tree saplings. This he did with ease, driving the ungainly looking machine on its caterpillar tracks though the trees without damaging any. Many thanks to Steve for completing this delicate procedure. 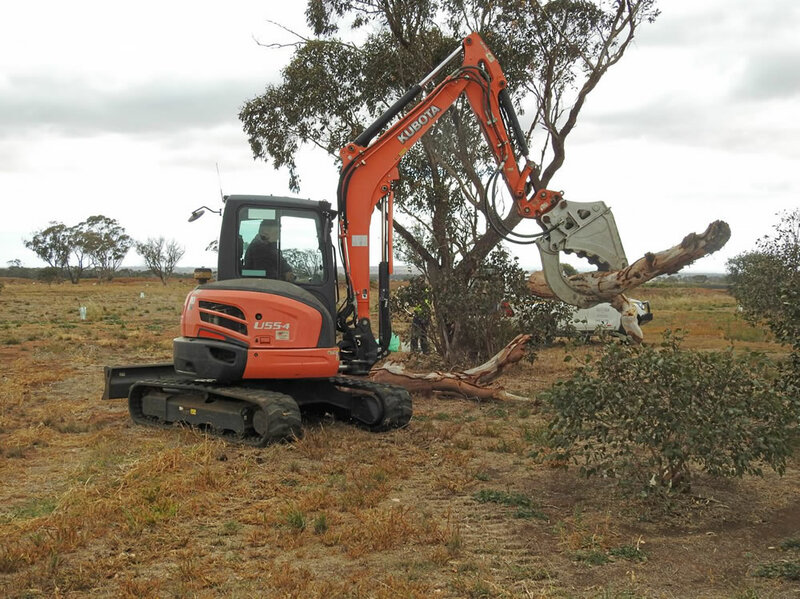 On the day for the logs to be relocated to their eventual positions among the Grey Box saplings a large contingent of managers and media people from Western Water, Lend Lease and Ballarat Line Upgrade arrived (in four carloads!). All parties involved in this project were keen to have the operation recorded so that their part in this large logistical event of environmental restoration could be given maximum publicity. 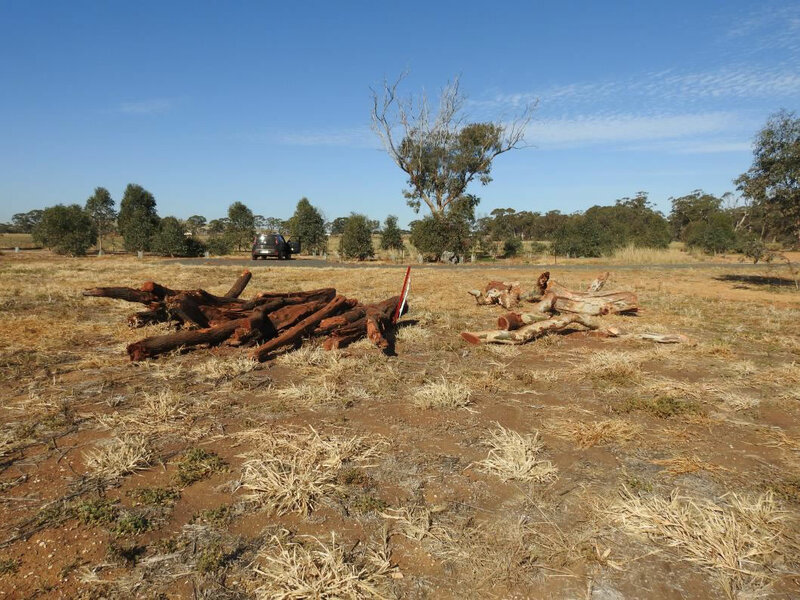 Clare the ecologist with Lend lease explained to Graham Holt, Western Water's Managing Director of Corporate Affairs the immense ecological value of placing the logs in the paddock. 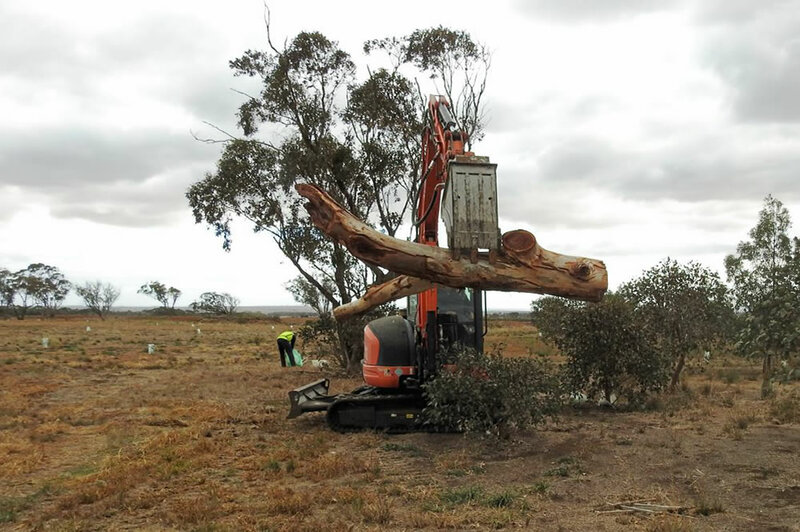 The presence of several ecologists & similarly inclined people involved in the Ballarat Line Upgrade project no doubt influenced their willingness to relocate the logs. Also the opportunity to get some positive publicity from what amounts to environmental destruction was probably considerable, as evidenced by the size of the management and media team. Steve (of Western Land Services) watched in amazement as the four carloads of people came down the track towards us! Perhaps his largest audience as the dozen or so people watched as he relocated the logs. A production bigger than Ben Hur! This has been a complex environmental project involving many parties, between a seemingly unlikely group of parties including Regional Rail Revival Melbourne Metro Rail Authority, Melbourne Metro, Lend Lease, Western Water and Pinkerton Landcare & Environmental Group. It has resulted in the paradox of an environmentally constructive project arising in the wake of unavoidable environmental destruction. Many thanks to all parties involved.